Maximum size: 60 mm (Kay, 1979). Identification: This is a brown to olive-green sea hare flecked with white and usually with small white and brown ocelli on the sides of its parapodia. The parapodia are tall and ruffled. 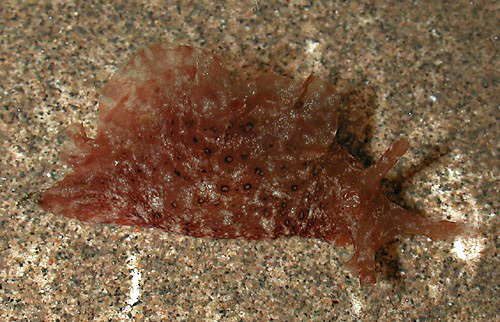 Natural history: Aplysia oculifera is a moderately rare sea hare found in protected to moderately exposed rocky habitats and Halimeda kanaloana beds at depths of < 1 to 9 m (< 3 to 30 ft). Scott Johnson also reports it from the intertidal (Bertsch and Johnson, 1981). Taxonomic notes: It's referred to as the "eyed sea hare" in Hoover, 1998 & 2006. It's likely that the animal listed as an undetermined form of Tethys in Edmondson, 1946 was this species. Photo: CP: 20 mm: found by PF; Maalaea Bay, Maui; April 6, 2005.